Finally, the Holland America Westerdam made it to Half Moon Cay, Bahamas. 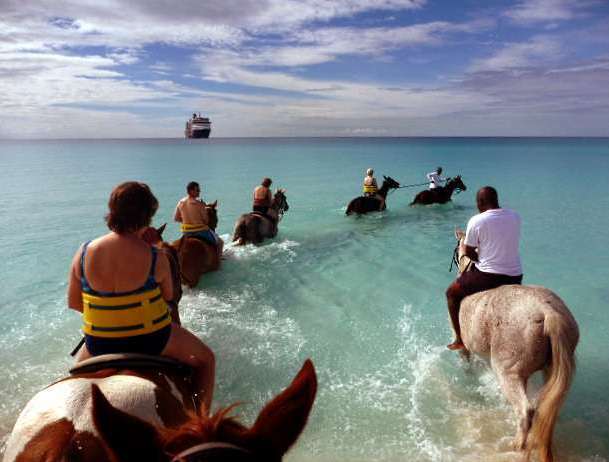 About 6 months before we booked this trip, I read in the Mariner Magazine (which Holland America sends to past guests) about the “sea” horses swimming on the ride at Half Moon Cay. I wanted to take a Caribbean cruise anyway, and on Holland America specifically after I read that article. I looked forward to the horse ride by land and sea more than anything else ever since we booked this cruise. I couldn’t believe my luck when the cheap cruise we stumbled on just happened to be the one I most wanted to take. Why, someone might wonder, would a person who has horses of their own want to pay good money to ride rental horses? It’s all about the long warm ocean swim. That Mariner Magazine article made it sound so wonderful. I’ve had horses most of my life, but rarely had opportunities to swim them. Never for long distances and only in cold water. When my kids were young, we discovered a small lake several miles down a trail we could ride to from our house. We rode a couple miles down the road to get to the trail. Considering the distance, we didn’t go there often, but when we did we had a great time. One side of the lake dropped off rather steeply, but the other had a nice gentle slope perfect for wading horses into the water. As we reached the middle it was just deep enough to swim a few strides before their hooves touched bottom on the other side. Then one summer we rode all the way there to find the lake surrounded in houses and completely inaccessible. We didn’t get to swim our horses again until a 4-H trip to Nehalem Bay State Park on the Oregon Coast. Most people carefully avoided the large potholes. Easy to spot by their dark blue color, we all carefully rode around them until Maria, one of the 4-H girls, trotted her horse off the edge and splashed down in one. Any other 4-H leader probably would have come unglued and scolded her mercilessly, but I thought it looked like fun. So I tried it myself. Everyone in our group tried it. We dubbed it “cliff diving” and from then on it was our favorite thing to do whenever we went to Nehalem Bay. The water usually wasn’t quite deep enough for swimming in the potholes. Once on an incoming tide my rather tall quarter horse, Taylor, splashed down into a hole deep enough he actually swam a few strides. found a gently flowing sandy bottomed river to ride down. Every now and then we hit a spot deep enough that the horses had to swim a few yards before touching bottom again. 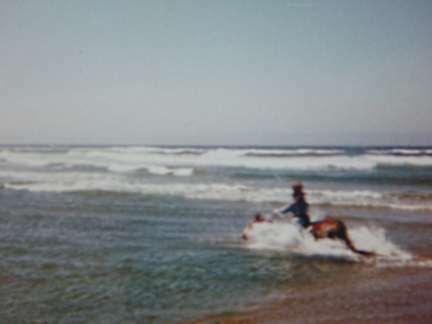 Except Sera, my Arabian mare who could not swim. She’d sink down under water and jump up for a breath of air. So we sent her rider, Johanna, a 4-H member without a horse of her own, to the riverbank. She had to follow on shore while the rest of us stayed in the water. I haven’t had a chance to swim a horse since, and never in warm water or for more than a few strides. This long warm ocean swim at Half Moon Cay was to be the highlight of my cruise. I anxiously looked forward to that moment. We booked the first ride of the day within days of booking the cruise. I did not want to run the risk of missing out because the ride filled up before we got signed up for it. Saddle up for the experience of a lifetime! 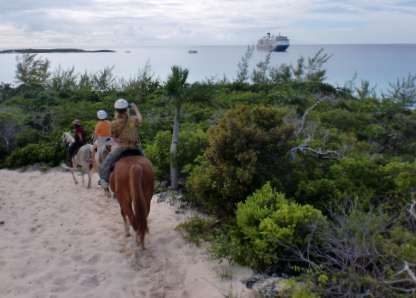 After a short tram ride to the corral you’ll receive an orientation before setting out on a ride along winding trails up to the highest point on the island for a panoramic view of Half Moon Cay and the surrounding islands before you continue along the bay, back to the corral. 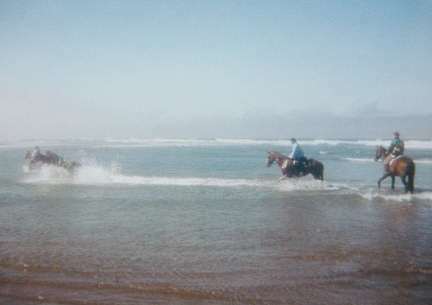 Enjoy a refreshment as your horse is “dressed” for swimming in a special saddle pad and a rope halter (no saddle), then you’ll venture into the ocean for the sensation of riding a horse while it’s swimming! Ride the tram for the trip back to the Welcome Center. Wear your swimsuit under jeans or long pants. Bring tennis shoes, sunscreen, towel and camera. Sandals not permitted. Minimum age is 10 years. Maximum weight is 250 lbs. We gathered on the stairs with all the other folks awaiting the first tender of the day. They don’t have to take down any boats off the ship, the island has its own large tenders. Our scheduled ride time came and went and finally we boarded the tender to Half Moon Cay. We caught the tram out to the stable with the other passengers on our excursion. 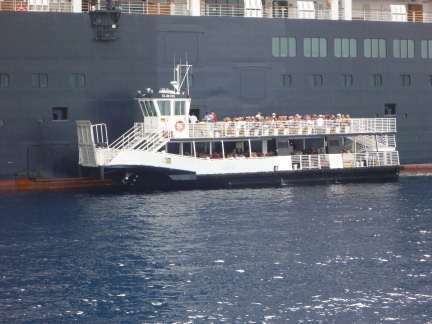 Our small group included several people from Holland America who wanted to experience the excursion for themselves. paired people up with horses the guides felt were a suitable mount for each person. Once mounted, we rode around an arena to get used to the horse while the rest of the group mounted up. Finally we set out for the trail. We followed a nice sandy trail past the pastures of the stable area, where chickens ran free and goats grazed on a hillside. As long as everyone stayed about 4 feet from the horse ahead of them and kept both hands on the reins all was well. Stray a few inches one way or the other or try to lift a camera up to take a picture, and one of the many guides (who probably have far less riding experience than me) was sure to snap. Riding English normally involves using both hands on the reins, but these horses wore western saddles. People traditionally ride western one-handed. After all, the cowboys need a free hand for their lasso, their gun, or to hold the leadrope to the first horse or mule in a pack string. I’m not sure why they thought western riders should keep both hands on the reins at all times on a trail where the horses had nowhere to go other than straight ahead. An instance of safety gone awry I think. Luckily these are tame rental horses, because 4 feet is probably the least safe distance should one be inclined to kick. Not that they would because rental strings don’t use kickers. Up close a kick may land, but has no power, and farther away they can’t reach the next horse. A horse length or about 6-7 feet is the true safe following distance. Perhaps 4 feet is the distance they best keep the horses bunched together and following one another. There really isn’t anywhere else for them to go with trees along both sides of the trail. Maybe they are afraid the horses will stop and munch the foliage and inexperienced riders won’t get them to move again. I ignored their scoldings and took pictures anyway. Why would they list a camera among the things to bring if they don’t want us to actually use it? Once while taking a picture, my horse walked around the opposite side of a tree from where the others went. Oh the horror! Runaway horse out of control, the guides came unglued. Honestly had I not had the camera up at that moment I would have purposely ridden on the other side of the tree from the rest just to do something different. At one point one of the Holland America people snapped at the guide to shut up and let her relax and enjoy the ride. This coming from someone who had never ridden before. I hope she reported this to Holland America and that they have asked these guides to back off a bit so people can enjoy their ride. pictures for me. As if. My brand-new camera that I just bought for this trip. He wouldn’t have any idea what photos I wanted, nor did I have a clue if he was any sort of decent photographer at all. Not that I’m a pro or anything, but at least they are my photos, not some random person’s. Finally a different guide who realized by then that I actually did know how to ride told him to leave me alone. Perhaps Holland America has had a chance to give these guides some training in customer relations by now if their people complained enough. I certainly hope so. Safety is important, but nobody did anything that warranted their constant correction and without it this would have been quite a pleasant trail ride. on you Holland America. If they aren’t going to swim you should promote this as a ride in the sea, not a swim. Honesty as they say, is always the best policy. If people get what they pay for you avoid bitter, bitter disappointment. I went on this ride solely for the swim. I looked forward to it for months. Not the highlight of the cruise I expected, or even anywhere near. Just an extremely huge letdown. I would not have booked this excursion had I known they did not actually swim. People who don’t know what swimming a horse feels like may enjoy this excursion, but you can’t fool someone who does. I felt pretty much the way someone who bought a lottery ticket actually expecting to win would feel when they found out that they didn’t. Several years later we finally got to swim with horses for real. 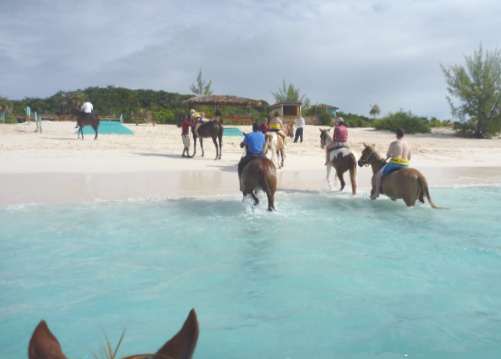 On a trip to Montego Bay, Jamaica we set up a private excursion at Half Moon Equestrian Center. Though the name sounds similar, this is nowhere near Half Moon Cay, which is in the Bahamas. If you want to see what it looks like when a horse actually swims watch this video from Jamaica which even has some underwater footage. This entry was posted in Caribbean, Holland America, Shore Excursions, Westerdam and tagged Bahamas, Half Moon Cay, Holland America, horse swimming video, Horseback Ride, Nehalem Bay, ocean rides, Oregon, shore excursions, Westerdam. Bookmark the permalink. Thanks so much for sharing. My husband and I are doing this excursion on our upcoming trip and now I KNOW what to expect. 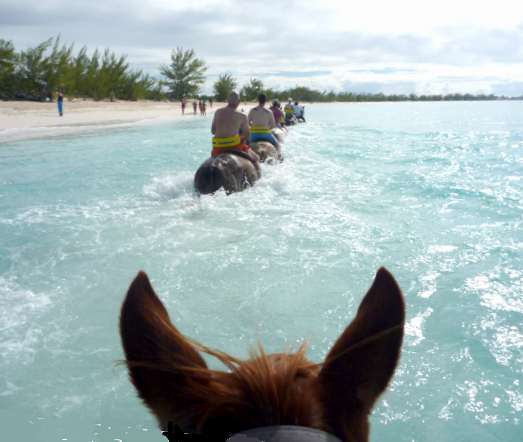 I am not an experienced rider, but I have ridden and I think I would recognize if the horse is swimming or not and that is why I wanted to do this excursion! I wish they had swam. There’s nothing else like the rush you get when their feet leave the ground and the water comes cascading over you. Most of them swim naturally, but I did have the one that couldn’t. She was starved down to practically a walking skeleton when I first got her though, and had some muscle atrophy issues, so maybe all her natural buoyancy was gone. The reason you were supposed to wear the flotation device around your middle if you were swimming the horse is because it’s alot easier for the horse if your weight isn’t on their back completely while they are trying to swim. It’s enough for them to have their own weight to carry around when they’re swimming, and is alot easier for them for you to float up and hold their neck or mane and let them pull you rather then clamping on around them and weighing them down. (Although, I don’t know why they insisted with this if you weren’t actually going to swim the horses…) But, it is a real disappointment when you were expecting the swim and you only got a walk in the water. Very interesting. Hard to imagine what would happen when most of the people have never even ridden on land before. The horses were swimming this week.The action of the horse is so different when swimming, and something we had not experienced before. When the waves came in u could feel the horse being washed ashore a little only to return to its original position.The water was about up to their withers and the warm clear blue water fealt great against our legs.The horses are all in first condition and they obviously love their work. We will be doing this again on our next visit to HMC,very enjoyable. We rode them on a clear calm day and when I asked why the horses didn’t swim the guide said they don’t. More than your legs would have gotten wet if they truly swam. We used to wade our horses out into the ocean and just stand still and feel them wash back and forth as the waves came and went. Didn’t have to be too deep to feel that. I’m glad you enjoyed your ride. Wow. Couldn’t even finish reading this horrible “blog”. The worst part of customer service is having to cater to know-it-all customers like you. Reading all the complaining you wrote made my stomach turn. I feel sorry for the poor guides who had you in their group. Since you are a know-it-all why did you fail to enlighten all us readers why the insurance company set all these safety guidelines? Why won’t the insurance company cover a tourist who falls off their horse & is injured due to “taking a picture”? Wow. Just wow. I can only imagine the guides’ frustration with a seasoned rider like you setting an example for all the other riders, experienced or not. After all, if you don’t have to follow the rules, why should anyone else? Next time, you should research your horse related activities better. What did you expect when the brochure said no prior experience required? I expected the horses to swim because the brochure said they would. Perhaps if you read the entire blog you would have noticed that the point of it was the cruise line did not deliver what they promised. The cruise line said to bring cameras, it was the guides who did not want to let people use them. 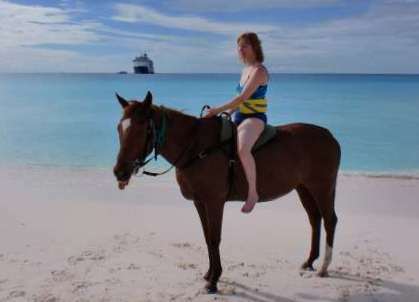 The cruise line also specifically said the excursion included a swim, going so far as to say “feel the sensation of a horse as it swims,” and yet they did not swim. My point was if they gave an honest description they’d have satisfied customers. People pay a lot of money for shore excursions and expect to have a good time. Had they said “ride in the water” instead of “swim” then they would have delivered as described (and I would not have chosen this excursion.) If you had read any of my other posts you would see that I do not complain about much. Almost everything I write is positive. I just had such high expectations for this particular excursion and experienced an enormous letdown when the thing I had looked forward to most did not happen. 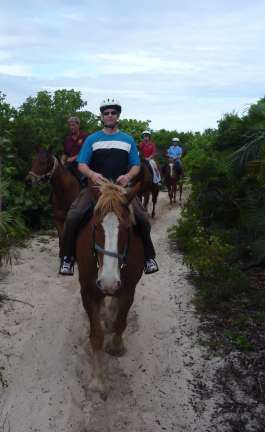 Hey there, thank you for revealing your opinions in Half Moon Cay Horse Ride. This is actually a cool blog. Hey there, can you tell me how much it costs to ride a horse at Half Moon Cay island?? It was around $90 when we did that excursion with Holland America. I just did this excursion and it was amazing. I’m not sure why your blog annoyed me, maybe because I read Kellybs’s response and thought, “that’s exactly right”, you probably spoiled the fun for everyone around you by complaining that your horse didn’t “swim”. Yes, the horses swam, maybe not like a dolphin, (after all, horses have 4 very long legs!) but if they were shoulder high in water and propelled themselves forward enough for you to get sprayed and partially submerged, then they were swimming. I certainly felt the “sensation” of them swimming and it was the highlight of our trip. I agree with the response above that people like you are every customer service reps nightmare, finding something, anything, to complain about. If you want to swim, go jump in a lake. My point exactly, most people think they are swimming when in fact they are not. Would it be any less fun if they had said ride in the water? If a horse is truly swimming its back will submerge and you would be floating along on that little float they fasten around your belly. If the horse is trotting through the water as they did when I took this excursion your legs will get wet and you will get sprayed as you described. They went out relatively deep, just not quite deep enough for the horse’s feet to actually leave the ground and its back to sink under the water. It is not swimming until its feet leave the ground. If they had promoted the excursion as ride in the sea rather than swim they would have been truthful. Most people don’t know the difference, assume they are swimming, and have a wonderful time. I’ve seen this excursion described in a magazine as trotting on land and galloping in the water by a non-rider who did not know the difference between one gait and another. They walk on land and trot in the water. I added a video of horses swimming to the blog so people can see for themselves exactly what a horse looks like when it swims. Pretty interesting actually. So is a customer service rep’s nightmare a person who realizes the excursion did not match its description? They could solve that by being honest, the entire point of this blog. Horses cannot swim with a person on their backs. They will DROWN, people.In actual fact their feet touch the bottom all the time. This is the nearest thing you can get to “swimming” with a horse. When they get out of their depth, the rider has to float off or the horse will drown. Listening to non horse people comment and criticize is sad. If you take a look at the video at the end you can see that their feet do indeed leave the ground when they swim. I did once have a horse that could not swim and would sink to the bottom and jump up for air if taken out too deep, but all my other horses that I ever had the opportunity to take into deep enough water for them to swim had no problem at all swimming with a person on their back for the short distance they had water deep enough for swimming. love that you told us what it was like. I was wondering what to wear so I am glad I read this. I will be riding Sept 2019. It is good to know what to expect. Holland America’s advice in the blog on what to wear is good with the swimsuit under your clothes other than I would add to make sure that your sunscreen is reef safe since chemical or oil based sunscreens harm coral reefs. The horses do not go into a coral reef, but water doesn’t stay in one place and neither do pollutants. I do hope you noticed that the video is from a private stable in Jamaica. 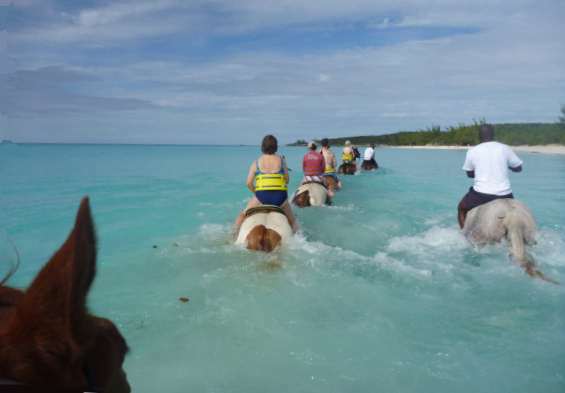 The horses do not swim like that at Half Moon Cay.